THE Legacy Commission suggested by the Eames/Bradley Group (Consultative Group on the Past) does not meet republicans’ call for an Independent International Truth Commission, Sinn Féin President Gerry Adams declared on Wednesday. The West Belfast MP was launching Sinn Féin’s proposals on truth recovery at a Belfast press conference with victims spokesperson Francie Molloy MLA and West Belfast MLA Jennifer McCann. 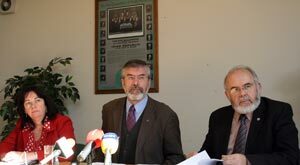 Speaking at the press conference, Gerry Adams said that he would call on republicans to participate and play a full role in an Independent International Truth Commission. “Sinn Féin have long called for the establishment of an Independent International Truth Commission to deal with the causes and consequences of the conflict. We repeat that call today. The proposed ‘Legacy Commission’ is not an independent international truth recovery process. “For a truth recovery process to be successful and to deliver for bereaved families and survivors it needs to have maximum participation. “I would call on republicans to participate and play a full role in an Independent International Truth Commission. “It needs to have the confidence of the community. It needs to be independent of the state, combatant groups, political parties, civil society and economic interests. It needs to examine both the causes and consequences of the conflict. The Sinn Féin document launched on Wednesday is, he said, “a genuine attempt to address this issue in a thoughtful and comprehensive way”. It contains a number of recommendations and commentary on proposals already put forward by the Eames/Bradley Consultative Group on the Past. Sinn Féin also stressed that “the body charged with this onerous task should have a remit to inquire into the extent and patterns of past violations as well as their causes and consequences”, including what it called “the tragic human consequences” of the conflict. “This body should also examine and report on institutional and collective responsibility, and must be independent of the state, combatant groups, political parties, civil society and economic interests. • The public reporting of its findings, conclusions and recommendations. “This should be underpinned in legislation,” states the Sinn Féin submission. At the launch of the submission, Sinn Féin President Gerry Adams outlined his view that the Sinn Féin proposals were the best way to take this forward. “We reject all attempts to create and sustain a hierarchy of victims. “All processes should be victim-centered and should deal with all victims of the conflict on the basis of equality. “Truth recovery cannot and will not be dealt with through a British or unionist prism or, for that matter, through an Irish republican prism. “The British Government, which has historically played such a divisive and violent role in Irish affairs, must join in an honest endeavour which allows the people of our island to carve out a new future. “The British Government has pursued, as a matter of policy, the use of administrative and institutional violence and collusion. “It has employed the full weight of its political influence and authority to actively deny, cover up and block truth recovery processes. “This has involved the suppression of reports by various commissions from Stalker to Sampson, to Stevens, and has also refused to fulfil its commitments, for example, on the Pat Finucane murder case or its refusal to co-operate with the Barron Commission on the Dublin/Monaghan bombings. “If there is to be an inclusive healing process and a genuine process of reconciliation, then the British Government must face up to its responsibilities. “The Irish Government has a constitutional, legal and moral responsibility to actively promote and encourage this course of action. “All of us have to pledge ourselves to tell and hear the truth about the past. “Building a united, harmonious society demands that all the difficult issues are dealt with in an equal and inclusive way and as a necessary part of putting the past behind us.